Make Music Southeastern CT is a live, free musical celebration on June 21, the longest day of the year, with concerts on streets, sidewalks, and parks across the region. What is Make Music Southeastern CT? 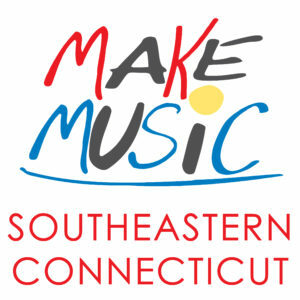 Make Music Southeastern CT is a part of the international Make Music Day movement which brings free, community-wide, outdoor musical celebrations to hundreds of cities worldwide! Every year, the celebration is held on June 21, the summer solstice, in more than 800 communities around the world. Make Music Southeastern CT will feature musicians of all abilities and music from any genre. Sidewalks, parks, front porches, and public spaces throughout the region will become stages for local musicians to perform and for all to enjoy. Everyone is invited to participate in this international day of music by performing, providing an outdoor space, appreciating, or volunteering. All are welcome to participate- no experience necessary! Join a diverse community of musicians and help fill every town and city in Southeastern CT with music. Soon you can register in our scheduling system, browse artists and request performances. Make Music Southeastern CT is brought to you by the Southeastern CT Cultural Coalition as part of our mission to contribute to the cultural identity, economy and quality of life of Southeastern Connecticut by advocating and supporting arts, heritage, cultural and business activities and organizations. Make Music Day Connecticut is being administered in partnership with the Connecticut Office of the Arts and many local and regional partners across the state. Make Music Southeastern CT is modeled after a Parisian tradition (Fête de la Musique) that began in 1982 as a tribute to the Summer Solstice. More specifically, each June 21st Paris is filled with musicians of all kinds performing on sidewalks, lawns, balconies, in parks, etc. for anyone to enjoy at no cost. In 2007, Fête de la Musique crossed the Atlantic with the debut of Make Music New York. Ever since, cities around the world have been starting their own Make Music days. Join us for the second annual Make Music Southeastern CT on Friday, June 21, 2019!! Using our matchmaking software venues and musicians can register, create profiles and find a match for their Make Music Southeastern CT performance. Setting up your own event is easy. Here’s how. Register online through June 1st using the Make Music matchmaking program and create a brief profile. If you have a location already, great! If you have confirmed performers already, great! Enter your information to show up in the listings. Don’t have a location or looking for performers? That’s okay, you can find one using the Make Music “match-making” platform by following the instructions below. Helpful Note: This platform works like a dating website, it is up to you to reach out and set up the details of your performance “date.” Making a request increases your chances of a performance. Interested in performing during Make Music Southeastern CT? Musicians of all abilities and genres are invited to showcase their talent and share their love of music! The event is an all-ages, all-inclusive celebration of music. Register to be a performer by creating a profile, browse available venues, and make an offer to perform in a Southeastern CT location. The venue will confirm your request. Venues may reach out to you directly once you have created a profile. There is no fee to participate. Everyone, regardless of age, ability, or preferred musical style can participate. We encourage you to embrace your inner musician, share music freely with your peers, and celebrate the rich musical diversity of your communities. Create your profile by submitting a photo, description of your act, and any relevant website/social media links. Check out the available venues and bid on one that will fit your needs. When venue confirms your request, your event will show up in the online listings. Stay in touch with the venue to make sure everything is set for your performance on June 21. Make Music Southeastern CT wouldn’t be possible without venues to host musicians. Venues can be in front of or in stores and restaurants, front porches, parks, schools, and more. Venues may be located indoors or outdoors (preferably outdoors) and must be accessible to the general public without an entry fee. Register to be a venue, browse musician profiles and request a performer you’d like at your location. Musicians may reach out to you directly once you have created a profile. Whether you have a restaurant, a storefront sidewalk or just a spacious front garden, any location can host a performance or participatory event as long as it free and accessible to the public. Make Music Southeastern CT is a unique way to activate your space, engage your community, and inspire anyone and everyone to discover the joy of making music. Create a profile by submitting your location information and a description of the space. Peruse the musician profiles and request a performance with one that fits your space. Confirm the connection when the artist accepts and your event will show up in the online listings. Stay in touch with the musician and make sure your space is ready to go on June 21. Make Music Southeastern CT is a program of the Southeastern CT Cultural Coalition, a non-profit organization whose mission is to foster region-wide economic growth in New London County by optimizing existing and new arts and cultural activities to assure that cultural sector and creative business assets are central to the vitality of the region. Help us make events like Make Music Southeastern CT possible! Click here to make a tax deductible donation! Interested in being a sponsor of Make Music Southeastern CT, contact Wendy Bury at (860) 448-5135 or W.Bury@CultureSECT.org. There were 40 different acts performing around downtown New London on Thursday, and we set out to see all of them. The performances were part of Make Music Day, a free, worldwide celebration of music that takes place in more than 800 cities in 120 countries. If you are a venue located in New London, Rich Martin is the City of New London Make Music Day coordinator. Barbara Neff will provide support for performances in public spaces and the waterfront areas. Become a Sponsor of Make Music Day Southeastern CT! A range of sponsorship opportunities are available! All content © 2019 Make Music Southeastern CT, unless noted otherwise. Make Music Southeastern CT is part of the Make Music Alliance.